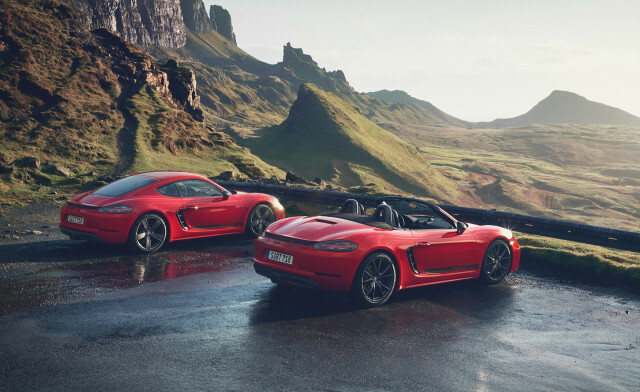 Porsche has expanded its 718 lineup with the new Boxster and Cayman T sports cars. The T in the name stands for “Touring” and dates back to the 1968 Porsche 911 T, which Porsche revived earlier this year with the 2018 911 Carrera T. It also represents a more purist take on the driving experience and focuses on driving pleasure, as opposed to raw power and speed. Peak output from the standard 2.0-liter turbocharged inline-4 matches the 300 horsepower and 280 pound-feet of torque of the base 718 models, and buyers can choose from either a 6-speed manual or 7-speed dual-clutch transmission. Where the Ts set themselves apart from the base models are the extensive chassis upgrades which include sport-tuned suspension with adaptive dampers and a 20-millimeter lowered ride height, 20-inch wheels, the Sport Chrono package, and the Porsche Torque Vectoring rear differential. To fit in with the purist theme of the car, buyers can choose to replace the infotainment system with a storage compartment. Door handles also become fabric loops, while the sport seats are more basic units with only two-way electronic adjustment. Put together, these measures balance out the additional weight created by the installation of the gasoline particulate filter. Porsche quotes a 0-60 mph time of a tick under 5.0 seconds and a top speed of 170 mph. Pricing hasn’t been announced but given the performance, expect the 718 Boxster and Cayman T’s positioning to be somewhere between the base and S models. Porsche also hasn’t announced availability but expect the showroom appearance to take place in the first half of 2019. The automaker is also preparing new flagship models for the 718 range. They’re essentially new versions of the Boxster Spyder and Cayman GT4 and should be coming with 6-cylinder power.